Trichoderma viride High Potency Biofungicide Trichoderma viride, 2x108 cfu/gm Monitor is a high cfu, high potency biofungicide that works against wilts and rots diseases. Each spore of Monitor is capable of forming a colony that coils fungal pathogens and parasitizes them completely. Apart from effective disease control, Monitor decomposes raw organic farm wastes, solubilizes soil phosphorus, reclaims adverse soils, promotes plant growth and protects soil eco-system. Monitor is water soluble, low dose, high efficacy product. Upon spraying, it leaves no stain on leaves and controls some foliar diseases also. SPECIALTY Water soluble, Low dose, High field efficacy and No staining on prayed leaf surfaces TARGET Seed and Soil borne fungal diseases and some foliar pathogens on all crops. SEED APPLICATION 2 gm/kg seeds. Water (ml)/kg seeds is to be fixed by the users. Seed treatment with Monitor protects crops effectively against wilts and rots. SOIL APPLICATION 250 gm/acre along with drip/flood irrigation or organic substances/manures. Some crops require spray applications. Monitor is compatible with all Sulphurs and can be even tank-mixed. 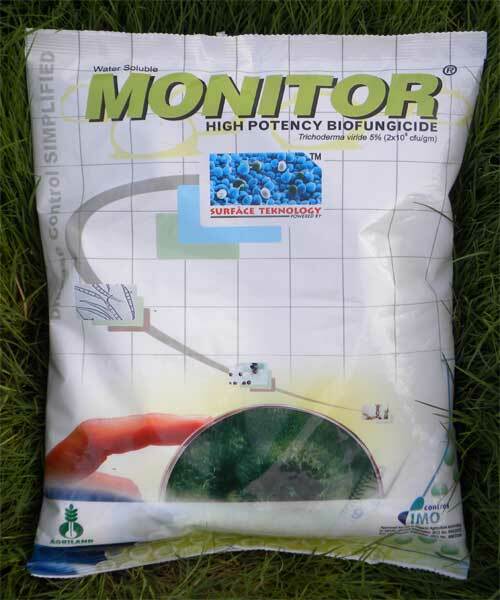 Do not use Monitor with other chemical fungicides except Sulphur.